has filed to run for the District 39 seat in the Florida Senate. 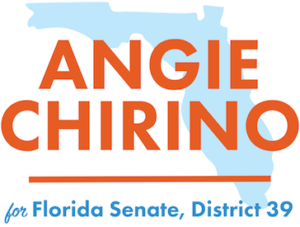 Angie Chirino today announced that she has filed to become a candidate for the Florida Senate in District 39. Chirino, a Republican, was a Grammy-award winning songwriter before leaving the entertainment industry to focus on raising her daughter and pursuing a career working with special needs children. The seat is currently held by Anitere Flores, who faces term limits in 2020. As a longtime child advocate, Chirino plans to focus her campaign on child safety and welfare, including improving Florida’s school system. Chirino’s platform also includes making healthcare more accessible and affordable, relieving traffic congestion, reducing tolls, and protecting the environment. Chirino, the eldest daughter of Cuban musician, composer, and producer Willy Chirino, penned hits for some of the most recognized names in the Latin music industry, including Gloria Estefan, Marc Anthony, and Celia Cruz. In 2000, she was awarded the Latin Grammy for Song of the Year. She walked away from her successful songwriting career to focus on raising her daughter and to pursue working as a paraprofessional with special needs children in the Miami-Dade Public Schools for eleven years. In 2016, Chirino joined the staff at Voices For Children Foundation, an organization that serves children in foster care through the Miami-Dade Guardian ad Litem program. Chirino herself is a Guardian ad Litem, and through her position at Voices For Children, she mentors young women and engages the public to help this vulnerable population. She is an Advisory Board Member for the Cuban Democratic Directorate, an organization which promotes democracy and human rights, and she serves on the Police/Citizen’s Advisory Committee for the City of Miami Beach. To learn more, please go to ChirinoforFlorida.com.